This April, SMS Equipment set up the Komatsu 980E-4AT—the world’s largest autonomous Komatsu truck in commercial operations—into production in Canada. The Komatsu 980E-4AT is designed similar to the established work horse 930E series. This truck with a capacity of 400 tons shares most of the features, for example, a simple and reliable hydraulic system design and established GE drive system. Fuel efficiency is increased because of the optimized air handling with two-stage turbocharging. The truck incorporates a Cummins 3500 HP SSDA18V170 engine. The introduction of these 980Es into the AHS environment wouldn’t be possible without our customers and distribution partners. They’re a big reason why Komatsu has the most autonomous systems, in the most mines, hauling the widest variety of materials, in the world. 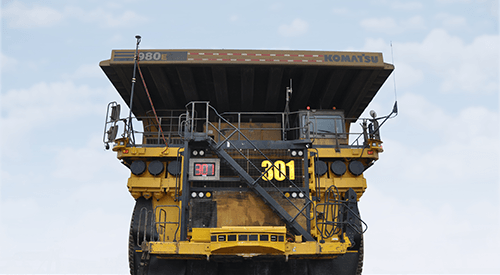 The addition of the 980E-4AT 400-ton autonomous truck is a game changer for Komatsu and our customers, delivering even greater value in enhanced mine productivity. SMS Equipment continues to offer leading technology solutions for the mining industry by working closely with its OEM Partners to deploy and support these technology programs such as autonomous haulage. We have invested heavily in developing an experienced team of autonomous mining specialists capable of supporting our customer’s needs from inception through to implementation and continuous improvement. The rapid increase in proposed autonomous projects will make Canada a global leader in autonomous adoption as Canadian mining companies focus on driving better efficiencies into their operations.